‘Tis apple season. You can literally feel it in the autumn air. There’s a mix of crispness and warmth…which is coincidentally a great combo for fall food. In fact, everything I’ve been cooking lately has included at least one apple. Seasonal fruit is just so darn tasty! I have a few recipes up my sleeve this season, but the first one I’m going to share is a caramel apple bread pudding. Not only was it inspired by the bushels of apples around my house, but also because of my caramel apple addicted family. Particularly my mom and brother. Each week they polish off at least dozen caramel apples, so it seemed like a fun flavor profile to carry into a new recipe. 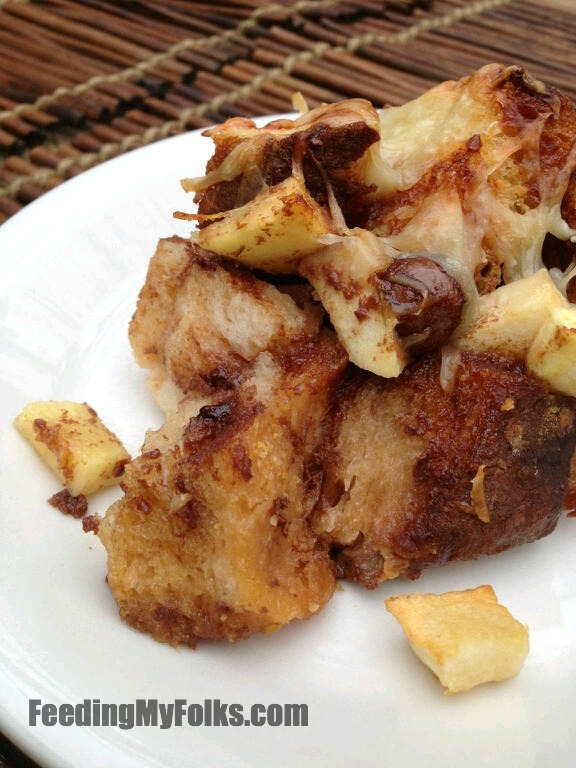 I love that the apples in this bread pudding really stand out despite the fact that they’re paired with a ton of tasty ingredients. Before I talk about the flavors, let me just say that I LOVE how apples maintain some of their crunch when baked. Their slightly firm, crisp texture is too good for words. Basically, Stephen loves himself some crunch. 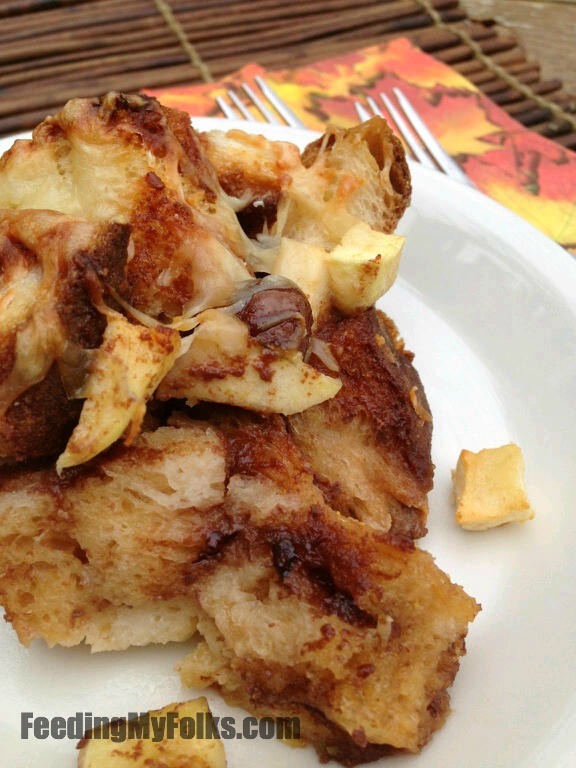 My caramel apple bread pudding is made from toasted rustic bread, freshly diced apples, and a deliciously simple custard. When all those goodies are in the pan, you drizzle a classic caramel sauce over every bit. The bread soaks the caramel and custard up so quickly, binding everything together in sweet perfection. Oh, it’s good. If you’ve been reading FeedingMyFolks for a while, you definitely know that I’m not a fan of SUPER sweet desserts. Stuff like that gives me a headache, so I’m really happy about this sweet/savory hybrid. To play up its savoriness, I top the entire dessert with shredded gruyère. 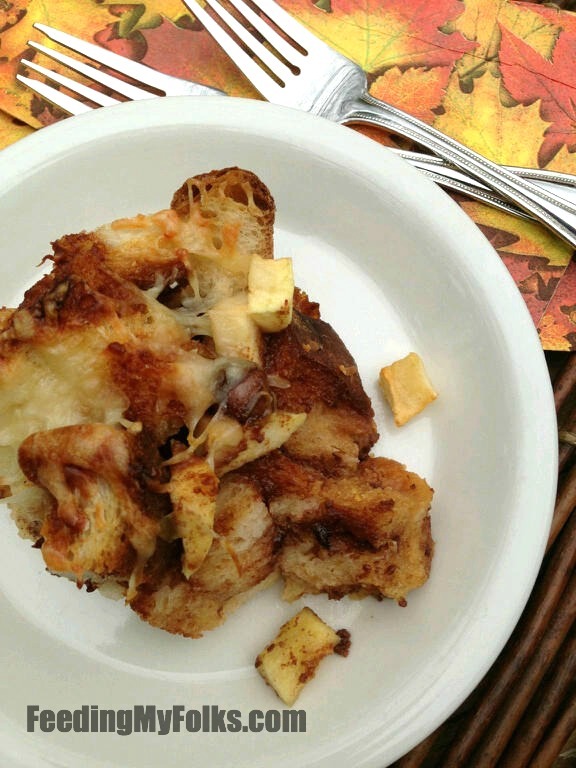 The cheese gives the bread pudding a subtle tang and a chewy crust. Before you think I’m gross for pairing cheese with dessert, think of a cheese plate from a fancy restaurant – it has bread, jam, crackers, and cheese. All that stuff is represented here, but with an autumn, caramel-y twist. Oh yeah! I almost forget to tell you: traditional bread pudding has regular raisins tossed into the mix. To amp it up a notch, I used chocolate covered raisins. It provides an unexpected extra sumtin’ sumtin’. It’s freakin’ awesome. Try it. You’ll never go back to regular raisins again. Preheat oven to 350 degrees Fahrenheit (if your bread isn’t stale, put the bread cubes in the casserole dish and allow them to toast while the oven preheats). While the bread is toasting, add the sugar and water to a medium sauce pan over low heat – whisk to combine. Allow this mixture to simmer for 5 minutes before raising the heat to medium. Boil until it becomes a clear “liquid” (it is incredibly hot…so stir gently). When it becomes golden brown (about 7-8 minutes of boiling), immediately remove from heat and carefully pour in heavy cream. The mixture will bubble up, don’t worry. Whisk until smooth. Add in the salt and butter. Cool. In a mixing bowl, whisk together the milk, eggs, and vanilla. In a large casserole dish, mix the cubed bread, diced apples, and chopped raisins. Pour the milk/egg mixture over everything. Drizzle with 1 cup of caramel sauce. Bake for 35 minutes, or until the cheese is golden. I’m glad you and grandma liked it, Mom!